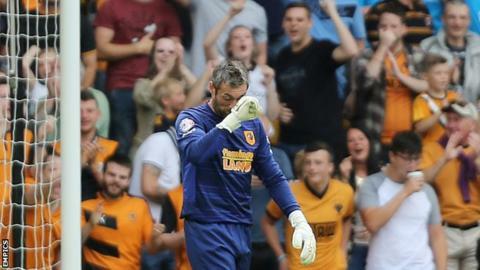 Wolverhampton Wanderers capitalised on a poor error from Hull City goalkeeper Allan McGregor to earn a draw in their first home league game of the season. James Henry nodded Wolves' equaliser into an empty net after McGregor had spilled Nouha Dicko's cross. The visitors had led in the first half through Nikica Jelavic's spot kick after Kortney Hause shoved Curtis Davies in the penalty area. Both sides' winning start to the season ended despite going close late on. Steve Bruce's side, bidding for an immediate return to the Premier League after relegation in May, have won just one away league game in 2015. That looked like changing when Jelavic converted from the spot for his first goal since February. Wolves deserved a goal of their own and they were rewarded in fortunate circumstances when McGregor, seemingly under no pressure, dropped a simple catch straight into the path of Henry, who did not miss. Chuba Akpom struck the post for Hull as both sides pressed for a winner, but the result means both teams remain unbeaten so far this season. "It probably was a fair result, we put in a good performance and I'm pleased with a lot of aspects. "We were probably unlucky to go behind on the balance of play. We kept going and got a little fortunate with the goal. "The last 10 minutes, when the energy went out of the game, Hull's quality on the ball really showed. They are a good side and a good yardstick." "The one thing in football management you can never legislate against is error. Unfortunately Allan will have to live with it - it's now how he copes with it. "We all know what a good goalkeeper he is, but goalkeepers are highlighted above everybody else - it's a big position. "We had an awful start from the first 30 seconds - the second half I thought we were excellent". Match ends, Wolverhampton Wanderers 1, Hull City 1. Second Half ends, Wolverhampton Wanderers 1, Hull City 1. Substitution, Wolverhampton Wanderers. Adam Le Fondre replaces Nouha Dicko. Attempt missed. Chuba Akpom (Hull City) left footed shot from outside the box is just a bit too high. Assisted by Moses Odubajo. Attempt saved. Chuba Akpom (Hull City) left footed shot from the left side of the box is saved in the top left corner. Assisted by Tom Huddlestone. Attempt missed. Tom Huddlestone (Hull City) right footed shot from outside the box is just a bit too high. Assisted by Andrew Robertson. Attempt blocked. Calaum Jahraldo-Martin (Hull City) right footed shot from the centre of the box is blocked. Attempt saved. Chuba Akpom (Hull City) right footed shot from outside the box is saved in the top centre of the goal. Assisted by David Meyler. Offside, Wolverhampton Wanderers. Richard Stearman tries a through ball, but Benik Afobe is caught offside. Substitution, Hull City. Calaum Jahraldo-Martin replaces Sam Clucas. Substitution, Hull City. Sone Aluko replaces Ahmed Elmohamady. Substitution, Wolverhampton Wanderers. Sheyi Ojo replaces James Henry. Attempt missed. David Meyler (Hull City) left footed shot from the left side of the box is close, but misses to the left. Assisted by Nikica Jelavic. Chuba Akpom (Hull City) hits the left post with a left footed shot from the centre of the box. Assisted by Nikica Jelavic. Attempt blocked. Nikica Jelavic (Hull City) right footed shot from outside the box is blocked. Hand ball by Kevin McDonald (Wolverhampton Wanderers). Attempt missed. Nouha Dicko (Wolverhampton Wanderers) header from very close range is close, but misses to the right. Assisted by Benik Afobe with a cross. Attempt saved. Nouha Dicko (Wolverhampton Wanderers) right footed shot from the right side of the box is saved in the bottom right corner. Assisted by Conor Coady. Attempt saved. David Meyler (Hull City) left footed shot from outside the box is saved in the bottom right corner. Assisted by Tom Huddlestone. Attempt missed. Dave Edwards (Wolverhampton Wanderers) right footed shot from the centre of the box misses to the left. Assisted by Dominic Iorfa. Corner, Wolverhampton Wanderers. Conceded by Andrew Robertson. Attempt missed. Tom Huddlestone (Hull City) right footed shot from outside the box is just a bit too high from a direct free kick. Attempt saved. Dave Edwards (Wolverhampton Wanderers) header from the centre of the box is saved in the top centre of the goal. Assisted by Kevin McDonald. Goal! Wolverhampton Wanderers 1, Hull City 1. James Henry (Wolverhampton Wanderers) header from very close range to the centre of the goal. Substitution, Hull City. David Meyler replaces Isaac Hayden. Attempt missed. James Henry (Wolverhampton Wanderers) right footed shot from outside the box is too high following a corner. Attempt blocked. Benik Afobe (Wolverhampton Wanderers) right footed shot from the centre of the box is blocked. Assisted by Scott Golbourne with a cross. Corner, Wolverhampton Wanderers. Conceded by Curtis Davies. Attempt blocked. Benik Afobe (Wolverhampton Wanderers) right footed shot from the centre of the box is blocked. Assisted by Dominic Iorfa. Attempt blocked. James Henry (Wolverhampton Wanderers) right footed shot from outside the box is blocked. Assisted by Dave Edwards. Offside, Hull City. Ahmed Elmohamady tries a through ball, but Nikica Jelavic is caught offside. Offside, Hull City. Curtis Davies tries a through ball, but Nikica Jelavic is caught offside. Attempt missed. James Henry (Wolverhampton Wanderers) left footed shot from the centre of the box is high and wide to the left. Second Half begins Wolverhampton Wanderers 0, Hull City 1. First Half ends, Wolverhampton Wanderers 0, Hull City 1. Attempt missed. Nikica Jelavic (Hull City) right footed shot from the right side of the box misses to the right. Assisted by Ahmed Elmohamady.